A few weekends back, Janimal and I visited a local yard sale. That’s when we came across this bad boy. It was sitting out amongst a pile of discarded furniture, and this poor piece looked very sad and lonely. I gave the nightstand a good once-over…pulled out the drawer (smoothly slid right out), looked for any significant damage (nope, nothing too bad)…and decided it was potentially worth bringing home. It wasn’t until I found out the price ($2! Say what?!) that I knew this little guy was all mine! It didn’t matter that I didn’t actually have a need for a nightstand, or even a home for the nightstand. Nope, those were insignificant details when it came time to purchase. 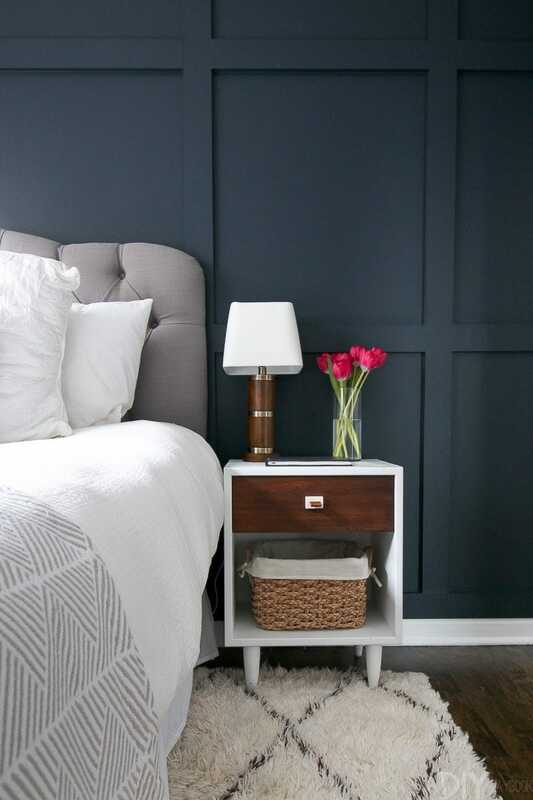 I brought the little wooden nightstand home and quickly came up with a gameplan for this makeover. For the past few months, I’ve been salivating over two-tone combos. Bright white paired with deep wood tones…the perfect match in my playbook. Luckily, I had everything I needed on hand (my DIY arsenal is building) and I got to work immediately. First up, sanding this beauty down. I used my favorite palm sander to give the entire piece a good once over. Once it was smooth, I washed away the dust, dirt, and grime with a soap and water combo and let the entire piece dry overnight. Next, I got to priming. I used a small roller and my favorite Zinsser Bullseye primer to give the entire piece a nice light coat. I used a brush to cover all of the small cracks and details. While that dried, I got to staining the drawer front. For this I used a Minwax stain and a soft cloth. I simply dipped the cloth in some stain, and gently rubbed it onto the front. After a few staining mishaps, this is now my go-to method. I can control the color better and there is never a sticky residue left on the surface of the wood. I poured in this white paint (leftover from my entertainment center makeover) and got going. 3 light coats later and the bones of the nightstand were complete! The only thing left to do was to seal my stained drawer front with Minwax wipe-on poly. This protects the wood and keeps it looking shiny and fabulous. I applied 3 coats with a soft cloth, and used steel wool to sand it down in between coats. Boom. My two-tone dresser was done over the course of a weekend.